are all ELF executable files. 1. The link editor may process it with other relocatable and shared shared object file to create another object file. 2. 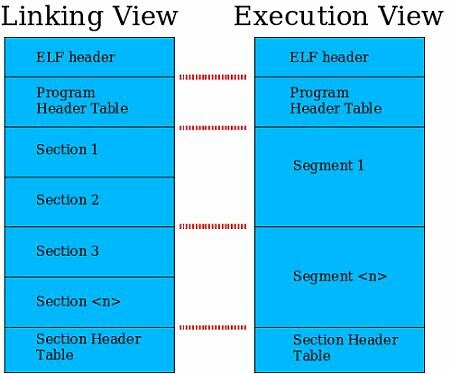 The dynamic linker combines it with an executable file and other shared objects to create a process image. which is useful for linking: program's code, program's data (variables, array, string), relocation information and other. So, in each area, several information is grouped and it has a distinct meaning: code section only hold code, data section only holds initialized or non-initialized data, etc. Section Header Table (SHT) tells us exactly what sections the ELF object has, but at least by looking on "Number of section headers" field above, you can tell that "test" contains 28 sections. * STACK : The segment is stack area. Interesting to see that all the fields except "Flg" and "Align" are given 0. Is it an error? No, it is valid. It is the kernel's job to decide where the stack segment starts from and how big it is. Remember that on Intel compatible processor, stack grows downward (address is decremented each time a value is pushed). Courious to see the real layout of process segment? We can use /proc//maps file to reveal it. is the PID of the process we want to observe. Before we move on, we have a small problem here. Our test program runs so fast that it ends before we can even dump the related /proc entry. I use gdb to solve this. You can use another trick such as inserting sleep() before it calls return().